Knopf Books for Young Readers, 9780375867545, 288pp. Former ESPN sportscaster Sandra Neil Wallace makes her young adult debut with a historical fiction novel that School Library Journal recommends to fans of Friday Night Lights in a starred review. Felix “Red” O’Sullivan’s world is crumbling around him: the mine that employs most of town is on the brink of closing, threatening to shutter the entire town and his high school with it. But Red’s got his own burdens to bear: his older brother, Bobby, died in the war, and he’s been struggling to follow in his footsteps ever since. 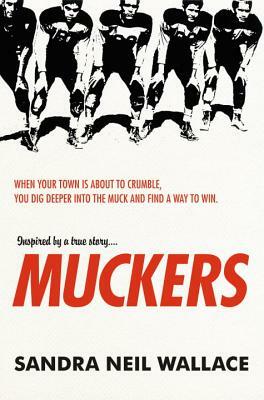 That means assuming Bobby’s old position as quarterback and leading the last-ever Muckers team to the championship. But the only way for the hardscrabble Muckers to win State is to go undefeated and tackle their biggest rival, Phoenix United, which would be something of a miracle. Luckily, miracles can happen all the time on the field. SANDRA NEIL WALLACE was a news journalist and ESPN sports announcer for more than 15 years before leaving television to write novels. She lives with her husband, author Rich Wallace, and their shelter dog, Lucy, in New Hampshire. Her first novel, Little Joe, was released by Knopf in 2010. "Wallace makes [her characters] live and breathe through careful attention to the quotidian details of local geography and universal motivators—guilt, friendship, spite, encouragement, anger, and talent."